This workshop is definitely one for the summer macro enthusiast. We’ll have an early morning start (precise time will be finalised in the run-up to the day based on weather conditions) which will give us the chance to photograph the rare Silver-Studded Blue Butterfly among other species while they are still roosting: this particular site is also good for other insect opportunities including grasshoppers and moths. The rest of the day takes us to two further sites which offer an array or orchid opportunities with Great Butterfly, Bee, Common Spotted, Marsh Helleborine and Twayblade among the opportunities with further butterfly species including small Pearl-bordered Fritillary also a possibility as part of a macro filled day. It’s an early start in north Shropshire where this workshop is based in order to look for butterflies as they finish their night-time roost: this is the ideal time to be photographing them as they will not have warmed up and will be far less active making our lives a lot easier. 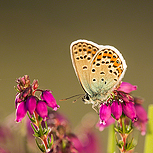 Key target species for the day is the delicate Silver-Studded Blue, with Small Heath, Ringlet and Small Pearl-Bordered Fritillary other possibilities throughout the day. After a hearty brunch (included in price) at an excellent nearby cafe, we’ll head off to spend the rest of the day at two or three excellent sites for Orchid photography. Species and quantities obviously vary each year but Common Spotted, Bee, Butterfly, Twayblade and Marsh Helleborine are among regulars we should get to work with. That said the emphasis of the day is more on ensuring that you get quality images of what we find and learn some additional macro photography skills rather than chasing new species. There will be a maximum of 6 attendees so that I can spend as much time with each of you as you’d like or want.